Last week,I was silk,my boyfriends was always looking after me .My best moving is that he begins to cook.Recently he teach me how to cook food named “Lily steamed Pumpkin”. Pumpkin is rich in vitamins A and soft fiber, low sugar, low calorie, contribute to weight loss. Lily addition to containing calcium, phosphorus, iron, vitamin B1, B2C,and other nutrients, but also contains some special nutrients, such as colchicine and other alkaloids. 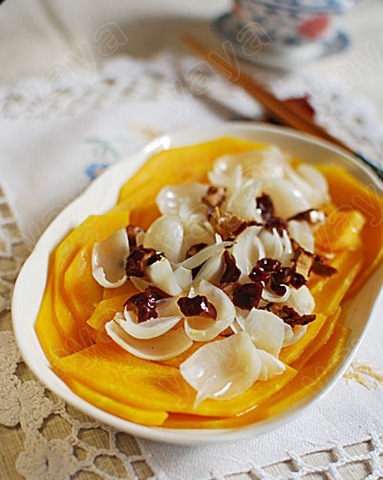 At first, the follow ingredients we should ready contain lily,pumpkin,jujube and rock candy. 2.Put lilies and rock candies on the pumpkin,dried. 4.Add 3 tablespoons of water,when the rock candies are all melting, pour in the steamed pumpkins and lilies. Lastly,our Lily steamed Pumpkin is finished.